Parties are always fun and with the growing popularity of Pinterest, it has become relatively easily to throw an amazing and unique get-together. However, as I browsed different pins and boards, I was only finding games and parties aimed toward kids and nothing was really aimed at a youth or adult audience. So, I created my own games and fun and wanted to share my insights for those who are throwing a superhero party for someone other than the little kiddies. Our group dressed up as their favorite superheros and were encouraged to be creative. Some made their own superheros up. Some got very creative with their costumes of well-known superheros. We gave awards out at the end of the night based around their creativity. Our group was split into four teams with about 8 people on each team. Then, we played three games. The first game we played is pictured in the first two pictures below. We set up a make-shift city (Gotham, of course) and taped printed out villains onto colored construction paper as a target. The targets were taped onto water bottles that had a little bit of water still in them so that they were stand up. 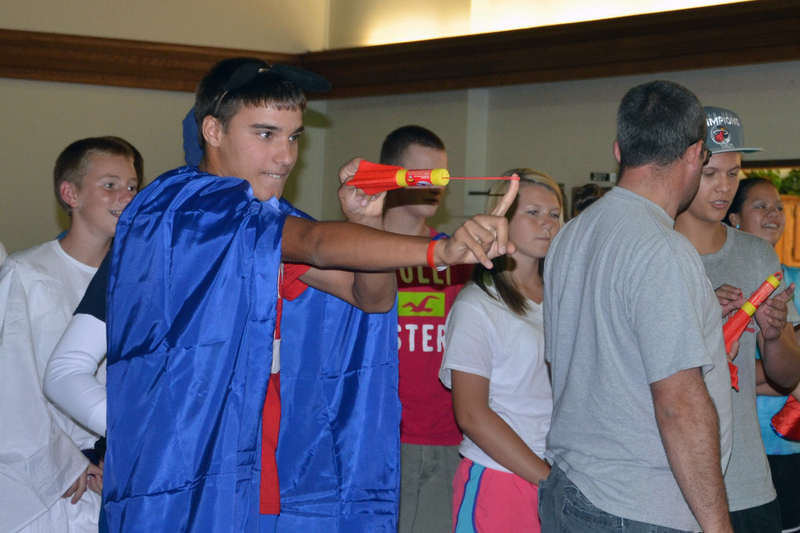 We taped off a spot to stand behind and our superheros used finger rockets to knock down the villains. 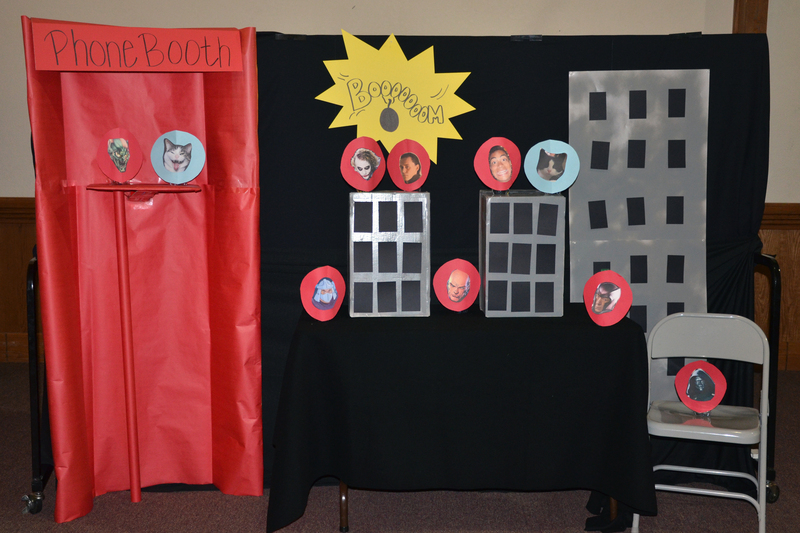 We also added our pet cats as innocent bystanders who counted as negative points if they were knocked down. The second and third games are not pictured because they do not need as much visual explanation. Our second game was an Alter-Ego Relay Race. 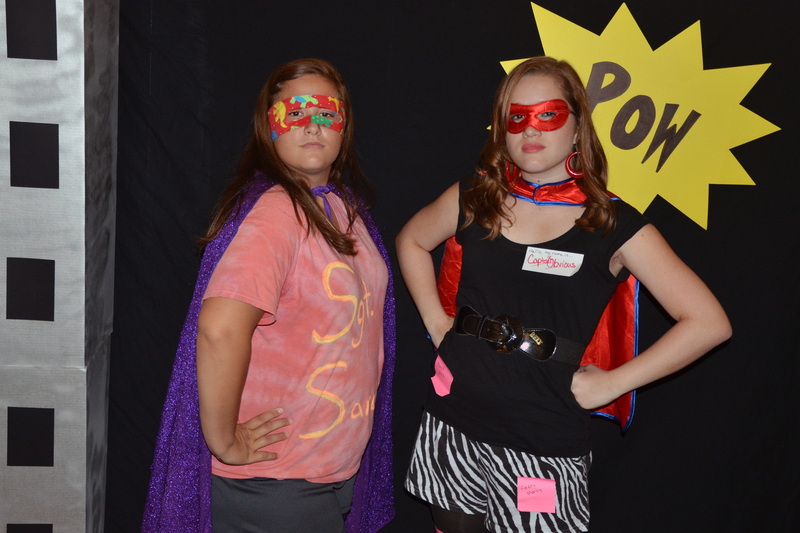 Team members had to run to the opposite side of the room and put on clothes that would serve as their superhero alter-ego. We used different costumes and props that we already had on hand, including wigs, sunglasses, and vests. The third game was trivia. We used buzzers that the church had for Bible Quiz and made up our own questions. Click here to see the questions we used. 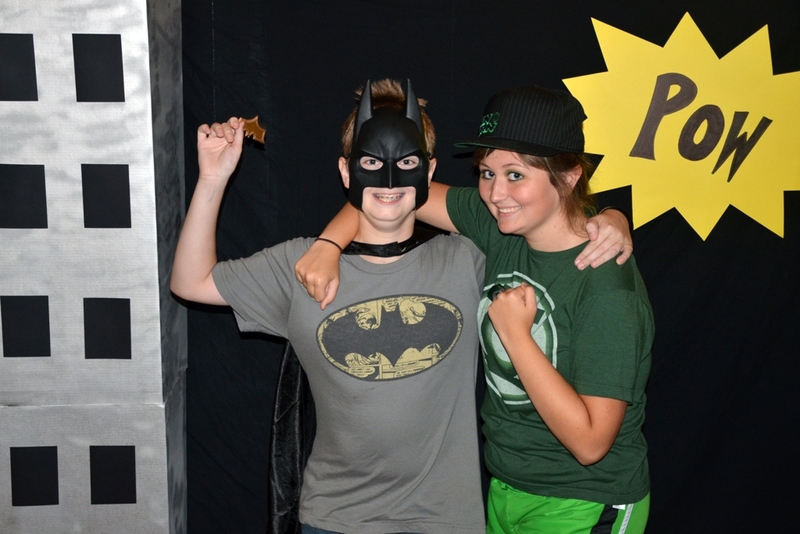 After the games and awards, we had a photo booth setup so that our superheros could get their pictures taken. 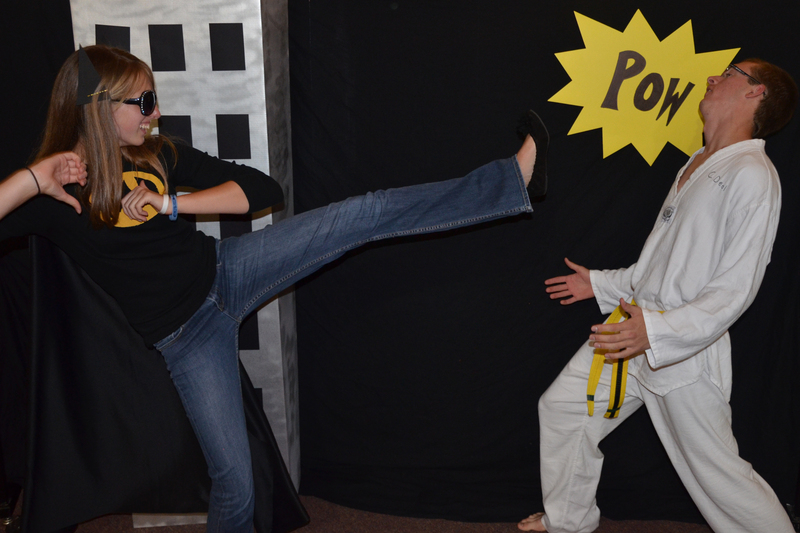 Below are a couple pictures from the photo booth! I made a “Pow” sign out of poster board and permanent marker, as well as a “skyscraper” out of three “science fair” tri-fold poster boards taped together that I spray painted silver. I also taped on black construction paper for windows. I thought that this was a great addition to our superhero party and offers a lot of room to be creative, especially because everyone loves seeing their pictures posted to Facebook once the event is over! Have you or are you having a superhero party? What are some of the things that you incorporated in yours?